Stir with ice and strain into a glass. I used a coupe, but a rocks glass with a big cube would work well too. Angostura Bitters would substitute well here in place of any of the soon-to-be less difficult to source replicas of Abbott's. For a nightcap two Wednesdays ago, I searched in Pioneers of Mixing at Elite Bars: 1903-1933 for a drink. There I found the Pals of Old which is somewhat different from the rye Negroni with a similar name, the Old Pal (or the Somerville riff, the Perfect Pal). I say somewhat since both drinks have a rye, vermouth, and third equal part format, with the Pals of Old calling for rum and sweet vermouth and the Old Pal for Campari and dry vermouth. 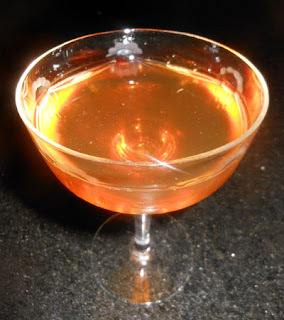 Since the Pals of Old lacks a bitter liqueur ingredient, perhaps it is more similar to the Saratoga with rum here instead of Cognac. For a sugarcane spirit, I opted for something richer than the lighter, grassier Bacardi rum of that era, namely Appleton V/X, to mesh better with the aged rye. The Appleton's aged rum notes filled the Pals of Old's bouquet. A grape and malt sip possessed a decent mouthfeel, and the swallow displayed a combined and smooth rye and aged rum flavor accented by clove-like spice. Nice catch! Yes, when I wrote my drink notes, I remembered that and just wrote "vermouth" and then I screwed up trying to squeeze out that post before I ran off to work. I have fixed the post accordingly. Cheers!